[I]f you look at their articles on economics [over at capmag.com], you will ... find the pro-inflationist supply-side economics advocated there.… This is particularly true if you look at older articles from 1999 or 2000. There you'll find many articles strongly attacking Ayn Rand's former associate Alan Greenspan—but not because he has abandoned his former hard money stance. No quite to the contrary, in true supply-sider fashion he was attacked for not being inflationist enough. Of course, in true supply-sider fashion they profess to be anti-inflation only to go on to attack the Fed for not lowering interest rates and increasing the money supply. What is puzzling about all this is that no one over at ARI should raise a word in protest. Since economics is considered a non-philosophical subject-matter, differences of opinion in that discipline are allowed. While that is entirely understandable, shouldn’t there be at least some limits? After all, would ARI wish to be affiliated with an individual who denied that the earth is a globe? Wouldn’t they, at the very least, wish to be on record as not advocating so obvious a detour into blatant evasion of reality? Well, as it happens, Salsman’s view are nearly on the same plane as those of the flat-earthers. He scorns what he calls the “myth of scarcity” and holds that the Stock Market of early 2000 was not overvalued! Austrian economists ... actually do advocate this and it’s perfectly correct for them to do so [Riesman wrote]. This is because we would all be better off if the Federal Reserve refused to lend except at an interest rate that was too high for anyone being willing to borrow at. In that case the Federal Reserve would be unable to affect the market in any way and might as well not exist. The Federal Reserve exists in order to make interest rates lower than they would otherwise be. It tries to achieve this by creating new and additional money and lending it out. The new and additional money appears on the market as an increase in the supply of loanable funds and in this way brings interest rates down. However, once the new and additional money gets out into circulation and is spent and respent, sales revenues and profits tend to rise throughout the economic system, which serves to increase the demand for loanable funds. If the Fed does not raise interest rates but simply provides more new and additional money to meet the additional demand for funds, the problem grows worse and worse. A rise in interest rates is essential to choke off the flow of new and additional money—to prevent a continuous acceleration in the creation of new and additional money. In objecting to this rise in interest rates, Salsman is in the position of advocating hyperinflation. Hyperinflation is profoundly destructive of wealth and rests on the total obliteration of any kind of objective standards in the economic system. [Rand’s hero from her novel The Fountainhead, Howard] Roark denies a basic tenet of sound economics--the principle of consumer sovereignty... [T]he goal of all rational entrepreneurship must be to satisfy the needs of consumers, not to ignore them! Discovering and fulfilling the needs of customers is the essence of market capitalism... In short, Howard Roark's [view of the customer] is irrational and contradicts a basic premise of Rand's Objectivist philosophy. For Roark, A is not A. He wants A to be B--his B, not his customer's A. Thus, Ayn Rand's ideal man misconceives the very nature and logic of capitalism--to fulfill the needs of customers and thereby advance the general welfare. As Ludwig von Mises writes in his book, The Anti-Capitalist Mentality, "The profit system makes those men prosper who have succeeded in filling the wants of the people in the best possible and cheapest way. Wealth can be acquired only by serving the consumers." (1972:2) Apparently Howard Roark doesn't believe in consumer sovereignty. As he states in his final court defense, "An architect needs clients, but he does not subordinate his work to their wishes." (1994:714) Really? So who is right about this issue? Is Salsman and Rand right that the entrepreneur should never "subordinate" his work to the wishes of his clients? Or is Skousen and Mises correct in their emphasis on consumer sovereignty? [Although] we must always start from the satisfaction of wants, since they are the end of all production, and the given economic situation at any time must be understood from this aspect, yet innovations in the economic system do not as a rule take place in such a way that first new wants arise spontaneously in consumers and then the productive apparatus swings round through their pressure. We do not deny the presence of this nexus. It is, however, the producer [i.e., the entrepreneur] who as a rule initiates economic change, and consumers are educated by him if necessary; they are, as it were, taught to want new things, or things which differ in some respect or other from those which they have been in the habit of using. [The Fountainhead's] thesis is entirely unrealistic in the everyday world of commercial building. Occasionally a client values more the notoriety of living in a home built by a signature designer than getting what he really wants, but not many. Almost all of Rand's scenarios are extreme and idealistic, a strategy that works to sell novels, but does violence to all sense of reality. Normally architects work closely with the client and make numerous changes in order to fit the client's needs. Objectivism and Austrian Economics: Salsman’s Revisionism. In the recommended bibliography of Capitalism: The Unknown Ideal, one finds more than a dozen books from economists associated with the so-called Austrian school, included eight works by Ludwig von Mises, whom Rand regarded as a “great economist” and whose works she recommended for dispelling the myth that ‘“laissez-faire’ capitalism is the cause of depressions.” Despite Rand’s endorsement of von Mises, Objectivism, under the influence of M. Northrup Buechner and Richard Salsman, has begun to distance itself from Austrian economics. Salsman has, in particular, focused his animus upon Austrian business cycle theory. Another common claim about stock-price gains in the 1920s is that they were made possible by Federal Reserve “inflation.” This view is held by many supposed free-market economists—monetarists and Austrians—and is certainly a tempting thesis for those who oppose central banking. But was Alan Greenspan correct when he wrote [in the Rand approved CUI], in the mid-1960s, that the late-1920s represented a “fantastic speculative boom” that was triggered by “excess credit” pumped out by the Fed—credit which then allegedly “spilled over into the stock market”? This view of the late-1920s stock-price rise could not be more wrong. In the Austrian theory of business cycles, it is easy to detect a lack of appreciation for the intelligence, wisdom and foresight of entrepreneurs, businessmen and investors. Austrian economists presume producers are easily fooled by government manipulations of money, credit, and the economy—especially by the alleged phenomenon of “artificially” low interest rates. They claim producers are conned into undertaking projects that later will turn out badly and require liquidation. In fact, producers are not fooled; they know, even if implicitly, which government policies are conducive to wealth creation and which are destructive. That is, they know when it’s worth producing and when it’s only worth shrugging. And when they shrug and production grinds to a halt, it does not grind to a halt because they had previously produced. When the Austrian view of the business cycle is coupled with a malevolent-universe premise—with the view that in the economy or stock market “what goes up must come down,” that “all good things must come to an end,” that no long ride of unbroken prosperity can ever persist without taking on irrationally exuberant hitchhikers—the combination can be catastrophic. For it can bring even purported champions of capitalism to openly endorse destructive policies such as Federal Reserve interest-rate hikes, curbs on the stock exchange, and more burdensome government regulations. I will discuss Salsman’s theory of the entrepreneur in my next economics post. I merely here wish to note the obvious ideological origins of Salsman’s ideas. Elsewhere on the web, Salsman has given 12 reasons why he disagrees with “contemporary” Austrian economics. I won’t list all the twelve reasons, since all but two of his reasons are either based on a malicious interpretation of Austrian doctrines or an inability to understand even the most basic economic concepts. But the last reason he lists is the most glaring and fatuous of all and gives the whole game away. 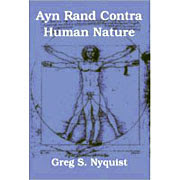 Salsman complains of the “animosity (and/or indifference) towards Ayn Rand and Objectivism” manifested by Austrian economists. In other words, Salsman resents the failure of Austrian economists to bend the knee at the altar of Rand. But is that any reason to disagree with someone—that they don’t worship your own private idols? Does Salsman refuse to get medical attention from any doctor who is indifferent (or who entertains animosity) towards Rand? Does he disagree with any specialist who, even though Rand herself recommended him, is not an enthusiastic admirer of Objectivist (or approved of by ARI)? Here we see, quite plainly, the poisonous fruits of ideology—that is, of making subservience to a system of ideas more important than any other consideration, including every consideration of truth, justice, fact and science. The Fed. According to Jerome Tuccille, Alan Greenspan once testified in front of congressional committee that if it were up to him (i.e., Greenspan), the Fed would be abolished. But Greenspan quickly assured the committee that none of his colleagues agreed with him and nothing along those lines would ever be done. In taking this position, Greenspan was merely echoing a view that had long become gospel among his former associates in the Objectivist movement. “ [W]e need to end the government's ability to set interest rates and create inflationary booms—and their inevitable busts—by phasing out the Federal Reserve and allowing the United States to return to a gold standard,” writes the current President of ARI along with coauthor Don Watkins. Now the real objection that Yaron Brook and other Objectivists have to the Fed is that it is associated with the government at all. It is the federal government’s bank run by the government’s appointees. The complaints about the government setting interest rates and creating inflationary booms and busts is merely an additional rationalization thrown in to strengthen their case. As such, it betrays a poor grasp of the relevant economic and political realities. In denouncing the Fed, Objectivists tend to be ruled, not by intelligence, but by mere ideological pretension. Their identification of the Fed with “the government” constitutes their first error. It is important in such circumstance to look beyond words and other mere appearances and get at the actual realities. When Objectivists equate the Fed with the federal government, what can they possibly mean? What part of the government is the Fed beholden to? To the executive? To the legislature? To the judiciary? The answer is: the Fed is not beholden to any single authority in the Federal government. The Fed is an independent, quasi-private institution. The original legislation for the Fed intended for that institution to be entirely private. But this aroused fierce political opposition and so a compromised was arranged. Thus the Fed became a quasi-private institution that enjoys real independence from the federal government. The executive branch nominates those who control the Fed, but the nominations are spaced out in such a way that no single administration could ever gain control of the Fed by nominating their own people. As a matter of fact, the whole culture of the nomination process tends to favor choices approved of by Wall Street. Indeed, the Fed is far more likely to be pressured or influenced by Wall Street than by the federal government. So if the Fed is not the creature of the federal government that it’s painted to be, what, then, is the objection to it? Objectivists might complain about the legal privileges enjoyed by the Fed. But it is not clear that getting rid of these privileges would get rid of the underlying problem. Even if the government had no official de jure bank, it would inevitably have a de facto bank that would enjoy many of the same privileges of a central bank. Abolishing the Fed would not abolish the government’s need for banking. The government would merely have to do business with a private bank. Yet whichever bank the government decided to do business with would effectively become a central bank in all but name. It would, of course, have no legal privileges; but then again, it wouldn’t need them. The fact of doing the government's banking business would endow it with de facto privileges. First of all, such a bank, holding, as it would, all the government’s wealth, could not be allowed to fail. No government would ever allow such a thing to occur. But once a bank find itself in a position where it won’t be allowed to fail, many of the other privileges of legally established central banks inevitably follow. Because it won’t be allowed to fail, the bank would become the lender of last resort. This would allow it to set a de facto equivalent of the discount rate, just as the Fed does today. One privilege such a private bank would not enjoy is the ability to engage in Open Market Operations. While some laissez-faire ultras might regard this as positive benefit, it is actually nothing of the sort. The Fed’s ability to engage in Open Market Operations is its one redeeming characteristic. For even if no Fed existed, Open Market Operations would still take place; only, instead of being conducted by an independent body, they would be conducted by the Treasury, under direct supervision by the President himself. Anyone who believes that would constitute an improvement suffers from an egregious naivete. The one advantage that the Fed brings to the table is that it prevents the executive or the legislature from having direct control over Open Market Operations. How important is that? Very important. It is through Open Market Operations that monetary policy is conducted. Any control that the Fed has over real interest rates and inflation is almost entirely exercised by buying or selling government securities to banks. Now it is important to understand that Open Market Operations are not a consequence of the Federal Reserve. Any militarily powerful and solvent government would be able to conduct monetary policy, by virtue of the fact that is has ample revenues. All that money concentrated in one institution would give that institution an inordinate influence over the banking system, regardless of any “legal” prerogatives it may or may not enjoy. Objectivists are naive about this because they are more concerned with defending their ideological convictions than they are with understanding the sobering truths of government finance. 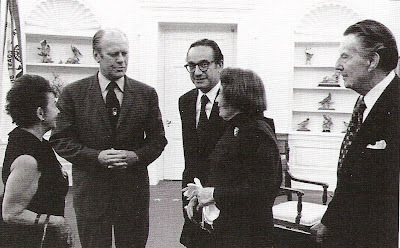 Ayn Rand at Alan Greenspan's inauguration as Chairman of the Council of Economic Advisers, 1974. "I can't say I knew Alan Greenspan, though, being an associate of Ayn Rand, I met him a few times in the 1960s. But by 1970--almost 40 years ago--I and a couple of other Objectivists in that circle already realized that Greenspan was compromising on her philosophy." Funny that. The above photo is from 1974 - four years after Binswanger claims to have discovered Greenspan's "compromising" on Rand's philosophy - of Ayn Rand and Frank O'Connor at Alan Greenspan's official inauguration by President Ford as Chairman of the Council of Economic Advisers". Hardly the way Rand recommended dealing with "compromise." Clearly Rand, despite the "MRI-like" psychological acuity attributed to her by followers such James Valliant and the generally millenial mental capabilities attributed to her by Binswanger and the ARI, had been unable to detect such serious divergences from her principles, despite the fact that she was closely associated with Greenspan (the other woman in attendance there is Greenspan's mother) and Binswanger had only ever met him a few times. Binswanger is saying in effect that he is better able to spot philosophical errors than Rand herself. Either that, or Greenspan's evil is so profound it was able to fool even the greatest genius of the past two thousand years. I suspect we'll increasingly be hearing the latter narrative. In other words, it's Nathaniel Branden all over again. Former Objectivist and regular ARCHNblog commenter Michael Prescott replies to current Objectivist and regular ARCHNblog commenter John Donohue, Pasadena with a simple yet devastating summary of the problems with the Objectivist Ethics. Prescott: John, I'm afraid you can't dismiss the is-ought issue merely by saying that Rand didn't regard it as a problem. It remains a huge stumbling block (in my opinion, a fatal one) for any naturalistic ethics, whether Rand chose to acknowledge it or not. "The fact that a living entity is, determines what it ought to do." 2. Does the concept of values apply to living things that have no conceptual consciousness? If not, isn't it a category error to talk about the "values" of plants and insects? 3. If biological self-preservation is the standard of value, then are we talking about the preservation of the individual or the community/species? If the former, then can't the individual do whatever is necessary to survive, even if it means looting and killing? If the latter, then can't the individual be sacrificed to the collective? 4. Isn't it begging the question to say that man's standard of value is the life "proper" to man, when determining what is "proper" requires a standard of value in the first place? 6. Is it really the case that man cannot survive unless he practices the Objectivist ethics? Do people who are dishonest, who lack integrity, who are nonproductive, who have self-esteem issues ... really die? Or do they somehow usually muddle through? Isn't it the case that some dishonest people make out very well in life? Is material success inextricably tied to personal virtue, so that millionaires are inevitably more virtuous than people who are less well off? 7. If life is the standard, then what exactly do we mean by life? Are we talking about simple longevity, or about quality of life? If the former, aren't there are many evil and destructive people who live to a ripe old age? If the latter, how do we use "quality of life" as a standard of value, when we need a standard by which to judge "quality"? And how can we objectively judge "quality of life" anyway? 8. Rand says that people who don't live up to her standards are subhuman. Isn't this is a backhanded way of admitting that it is possible to live a long, comfortable life without practicing her virtues, but then waving off this fact by asserting that such people "don't count" because they're not "really" human? In other words, isn't it just a rhetorical device used to disguise the fact that non-Objectivists often survive and even flourish - a fact that, if openly acknowledged, would prove fatal to her argument? 9. If man cannot survive without an explicit code of values, then how did human beings survive for all the centuries before philosophy came along to enlighten them? There are other questions, but I think that's enough to show that Rand's argument doesn't amount to much. It is good rhetoric, though. She was a first-rate polemicist, just not a first- or even second-rate philosopher. For reasons unknown, the sidebar disappears unless I insert a post above the "Ethics Of Emergencies" post. So here it is. Most men do not accept or practice either side of altruism's viciously false dichotomy, but its result is a total intellectual chaos on the issue of proper human relationships and on such questions as the nature, purpose, or extent of the help one may give to others. Today, a great many well-meaning, reasonable men do not know how to identify or conceptualize the moral principles that motivate their love, affection or good will, and can find no guidance in the field of ethics, which is dominated by the stale platitudes of altruism. Comment:The classic Randian bamboozling continues. Having argued, bizarrely, in the previous paras that altruism is simultaneously the cause of both complete self-sacrifice to others and sociopathic disregard of others, Rand then tells us that despite the "vicious" nature of this false dichotomy, most men do not actually accept either side of it. Well now, if that was the case one would think that harmless might be a better description than "vicious" - but we are not allowed to pause to notice such details as the outraged flood sweeps us on down to the sea of "total intellectual chaos" typical of human relationships over the unfortunate millennia prior to Rand's arrival. Things are in such a state that even well-meaning and reasonable people, minus Objectivism, simply are not able to "identify or conceptualize" the rational principles behind their emotions such as love, affection, or good will, and thus don't even know what "proper human relationships" are. On the question of why man is not a sacrificial animal and why help to others is not his moral duty, I refer you to Atlas Shrugged. This present discussion is concerned with the principles by which one identifies and evaluates the instances involving a man's nonsacrificial help to others. Comment: Two or three generic Randian tics are nicely evident over the past couple of paras. The first is the "false dichotomy". She manages to find one of these just about everywhere she looks for them, which I fear only engenders confidence in her when it should engender the opposite (one day it might be worth adding all of them up). The second is that no-one had Clue No.1 about anything - not even human relationships! - until she showed up. The third is the inevitable referral to the works of her favourite philosopher, herself. With these now out of the way we move to the fourth and most dominant Randian rhetorical move, and that is verbalism : the manipulation of the meanings of words. "Sacrifice" is the surrender of a greater value for the sake of a lesser one or of a nonvalue. Comment: Here, wittingly or not - English was not her native language, and Rand had consistently misunderstood other English words before - Rand performs a verbal switcheroo, and replaces the usual meaning of "sacrifice"- the surrender of a lesser value for a greater value - for its opposite meaning. This complete switcheroo (discussed a little more in our ever-popular "Understanding Objectivist Jargon" series) passes unremarked, and of course immediately begins confounding the argument. Thus, altruism gauges a man's virtue by the degree to which he surrenders, renounces, or betrays his values (since help to a stranger or an enemy is regarded as more virtuous, less "selfish," than help to those one loves). The rational principle of conduct is the exact opposite: always act in accordance with the hierarchy of your values, and never sacrifice a greater value to a lesser one. Comment: Obviously if you switch the meanings of words to their opposite, then start arguing against them, you are going to descend into nonsense. To start with, it's not necessarily the case that helping strangers is considered more virtuous than helping loved ones; for example the expression "charity begins at home." Further, people would normally consider a sacrifice virtuous when someone gives up something important to them - say their high paying job - for something more important to them - say to care for their children, or study a particular passion, or to help people if they so desire. In none of these cases are they "surrendering, renouncing, or betraying their values". Thus Rand's proposed "rational principle of conduct" is merely what people do already. Jason Sieckmann has requested that one of us at ARCHN provide "a list of [his] top ten fave philosophy books." Since this seems like a good idea, particularly in this Christmas season that is fast upon us, I will provide mine. Others can give theirs, if they are so inclined. Word of caution: the works by Santayana, Polanyi and Lovejoy make for rather difficult reading. But as Spinoza says, "All things excellent are as diffcult as they are as rare."